her children were almost grown. 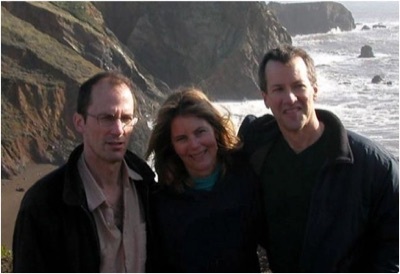 Stephen was in graduate school at the University of Southern California, David was an undergraduate at Wesleyan University, and Rachel had moved to the Bay Area. 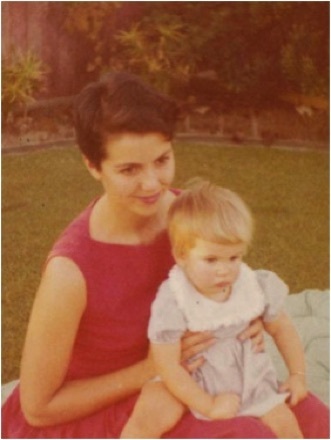 My knowledge of her children when they were young is by anecdote and old photos. 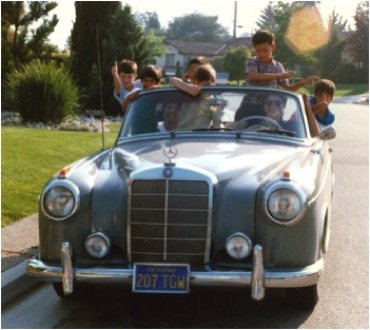 I have included some photos here of them taken in 1961-1962. 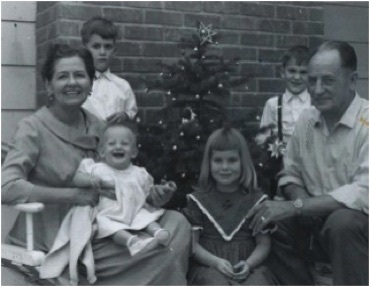 They were kept by their Grandmother Marian in a small brass case, with several other family photos. The case is engraved T. A. P. at M. A. G. which stands for Take a Peek at My Adorable Grandchildren. These photos reflect much of their personalities. 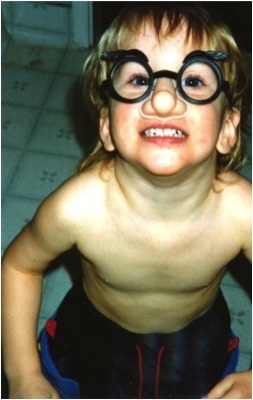 Stephen has always been the serious one, and academically inclined. 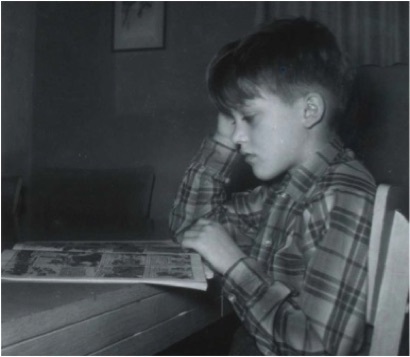 And yes, to this day, he maintains an interest in comic books. David has always been very personable, yet he often has a look in his eye that suggests he may be thinking about something he’s not going to tell you about. Rachel’s photos convey the basic goodness of her personality and her poise and drive. Note the cup is for an adult. Rachel and Alice share an uncommon intensity of purpose, and both have struggled against difficult circumstances to achieve their goals. I did not get to know Stephen very well until after Alice and I were married for some time. 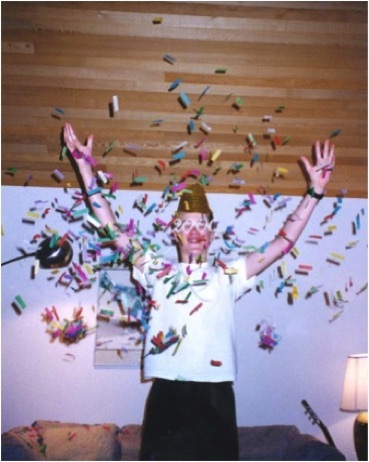 Stephen was then in the middle of graduate school at the University of Southern California. (He did his undergraduate work at Harvard.) When we had moved to Menlo Park where I was doing postdoctoral work at Stanford, he visited with us. 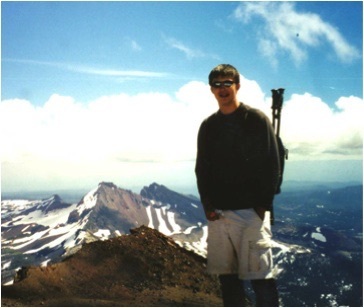 Later, while finishing his PhD after his field work in the Costa Rican highlands, he lived with us for a time while we were in Seattle. He married there and had two children, Matt and Kenny, and remains in Seattle. The marriage did not last. Alice and I are very proud of Stephen’s dedication to his children. For many years now, he and Chris Medina have been a couple. Alice and I both like Chris very much. She raised a daughter largely as a single mom. She and Stephen work well together, and now with their children grown, they have time to spend with one another -- and to enjoy interesting trips and outdoor activities. Stephen works as administrator and scientific editor for the Biomembrane Institute. This is a division of the Pacific Northwest Research Institute in Seattle directed by Sen-itiroh Hakomori, a Professor at the University of Washington and member of the National Academy of Sciences. Stephen also does considerable freelance manuscript editing for scientists in Argentina, Japan, Brazil and China. 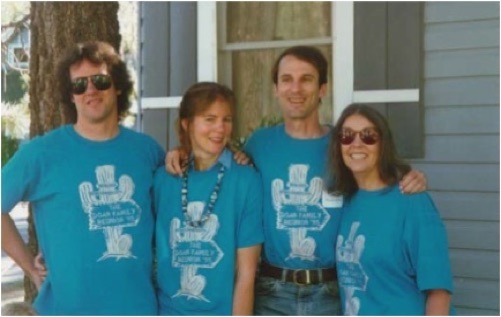 Below: Alice and her children at a family reunion in 1995. The photo above was taken not too long after Alice and I were married. The one on the right is more recent. 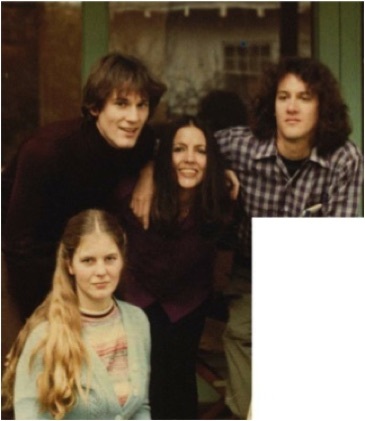 I first knew David when he was attending Wesleyan University in Connecticut. He would occasionally visit us, introducing us to yet another new girlfriend. He eventually went to the University of Wisconsin where he got his PhD in Mathematics. 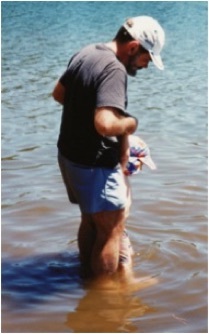 He stayed in Wisconsin for some time, and when we moved to Fermilab in 1984, he was nearby and we would drive up to visit with him. Madison Wisconsin is a very civilized university town, and was a welcome break from the rustic limitations of Batavia, Illinois. David was an avid bicyclist, riding his bicycle to the University even in mid-winter when the paths in Madison are covered with ice. David subsequently moved to Berkeley CA where he was on the faculty in the Computer Science Department. 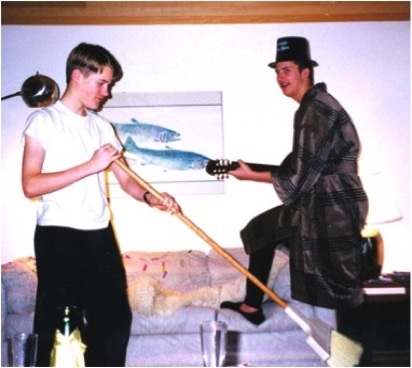 At some point he became disenchanted with the academic life and began work in a start up company that allowed him to combine his skills in computer sciences with his love of music. Both Stephen and David are excellent pianists. Stephen’s taste is for popular music, while David’s is for classical. But soon that role felt limiting, and he developed a field of his own. David is the developer of the Seti at Home software which uses distributed computing to analyze signals from radio telescopes searching for signals from extraterrestrial life forms. This project is a big deal, and David has been interviewed in the Economist, among many other places, for his work. He is now working on a broader generalizations of Seti at Home associated the Berkeley Open Infrastructure for Network Computing (BOINC), which uses distributed computing to deal with problems in areas such as biology and global climate change. He is director of both the Seti@Home project and BOINC. David now is an avid mountaineer. When we lived in Seattle, before he developed this interest, he took the photo on the right of Alice and me, which is one of our favorite photos. It was taken near Bridal Veil Falls on Mount Rainier. David and I have hiked together, and he is far the stronger. 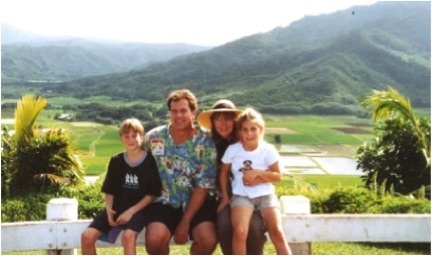 David once visited Alice and me in Ecuador. 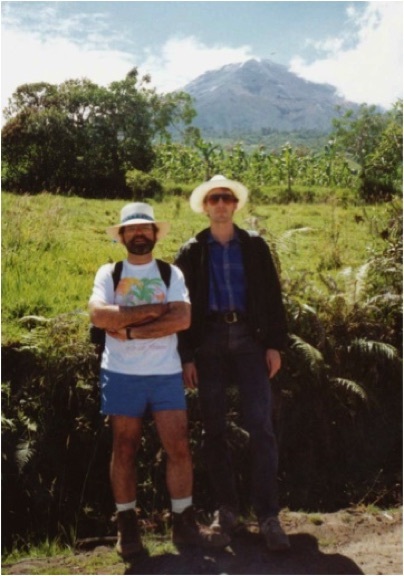 Alice and I had the advantage of being there a week, and being on top of Pichincha, which is around 15,000 feet, letting us become acclimatized. David had just arrived when we took him off to the slopes of Cotapaxi, up to somewhere in excess of 16,000 feet. Alice has always been proud that she hiked above the climbing hut to the trailings of the glacial cap of Cotapaxi, while David, exhausted from the altitude, rested in the hut. David recently married Erica Klarreich, who is a mathematician and freelance science writer. They now have a son, Noah. Rachel is an occupational therapist and lives in California. 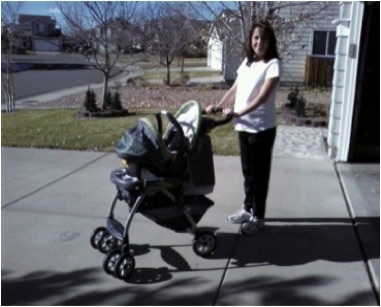 She and her husband Ron Elandt, have two children, Ryan and Emily Rose. Ron deals with all aspects of bees, and makes and sells honey. 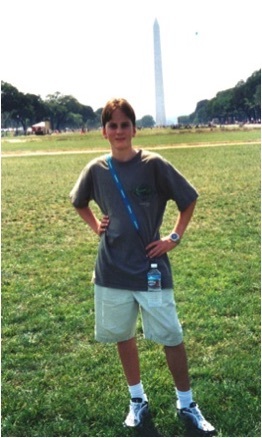 After recently getting her master’s degree, Rachel is now studying for her PhD in International Health Care. Rachel visited us once for several weeks while we were on an extended stay in Europe. She and Alice had a wonderful time together. I barely saw them because they were off to Paris, or Vienna or Cologne. I would occasionally catch up with them. Once I was told to meet them by the Neka River in picturesque Heidelberg. I found them sharing a pedal boat deliberately terrorizing ducks. The ducks were attempting to behave in a civilized manner. Once they left for Paris from Frankfurt where I was staying. They had checked some luggage in Frankfurt that proved impossible to open when they arrived for their midnight train. They went to Paris for a few days with only the clothes on their backs. When they returned, they were fined by the German Train Company for leaving their luggage in a locker over the 24 hour limit. They were not happy with Der Bahn (The Train), but few people are. In Vienna, they saw the Lippizaner Stallions and heard the famous boy’s choir. Perhaps their most memorable night was when they got to see a Berlin transvestite revue in Cologne. For them, I guess this was fun. Some things I don’t ask too much about. The photo on the right is Rachel enjoying a pastry at an outdoor cafe on the Champs Elysees. In addition to Alice’s biological children, we have a number of people we consider to be family. Chris Tiplady is Alice’s “virtual niece”. 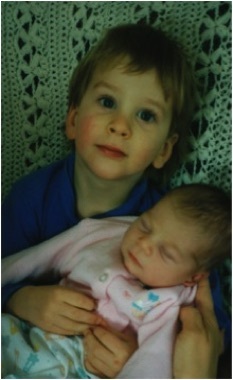 Chris and Alice met over the internet when the internet was still young. Chris is a computer science person. 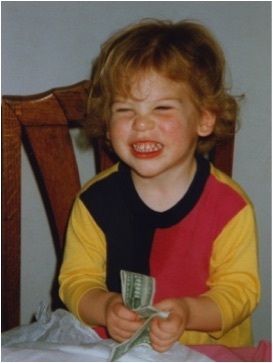 She works for the Federal Reserve Bank, and designs software to detect illegal money transfers. She is so good at this that she negotiated a position where she officially works in New York City, but does most of her work remotely from her farm in Vermont. 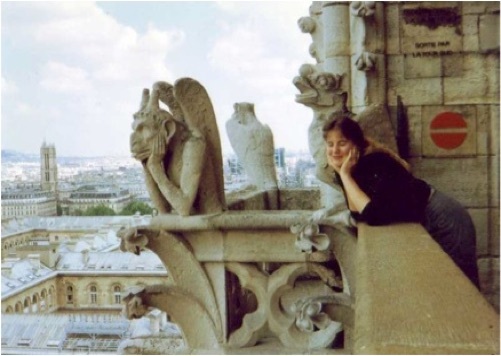 Chris is shy and quiet by nature, but we have enjoyed sharing vacations with her, and she has done some adventuresome travels on her own, including a trip to Scotland, where she developed an appreciation of sheep and goats. She is proud of the goats that she and her husband now raise on their farm. 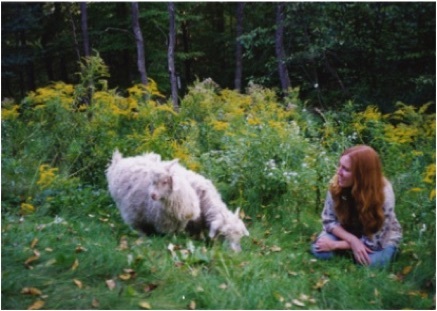 Left: Chris and her goats. Tad Smith became a part of our lives in Minnesota. 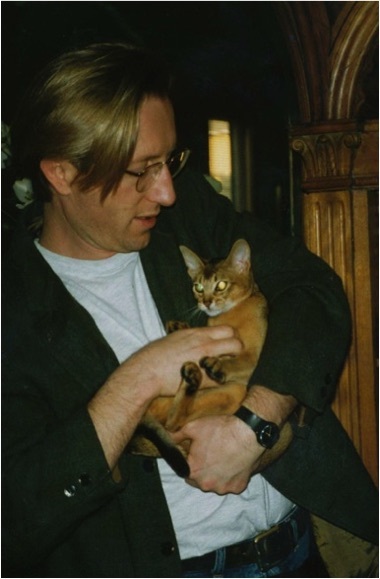 He would often stay in our house while we were away traveling, and sometimes we just encouraged him to stay between trips Our cat Shuwa and Tad were very close. Tad was a graduate student in theater arts at the University of Minnesota, and we enjoyed watching him act in a number of plays. Yolanda Wuth is a lifelong friend from Ecuador. 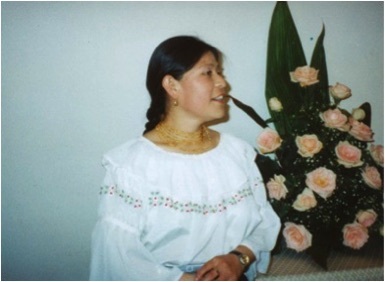 Yolanda helped Alice when she was working in the Ecuadorian highlands. and spent a year with her and her family in Berkeley afterwards. Alice thinks of her as a sister. 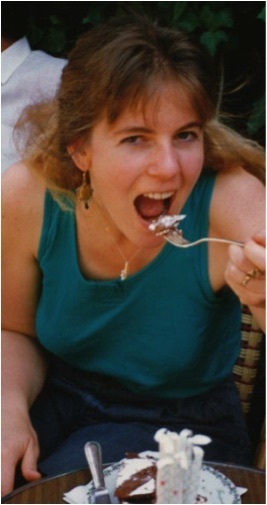 She eventually became a photographer in Mountain View, and we saw a lot of her while we were at Stanford, in the late 1970’s. But then she moved back to Ecuador to care for her aging mother; Alice misses her. Patty Yepez is a young Ecuadorian who has become almost like a daughter. She took care of a close friend of Alice’s, Narciso, while Narciso was dying of Lou Gehrig’s disease. She has a kind heart and is loyal and honest. She has a young son, Marlon, and a younger daughter Angelica, children she is raising now as a single mom. Life is tough in Ecuador, and Patty is indigenous and a woman, making it tougher still. It has been very difficult for strong people who are smart and hard working to find jobs in an economy that is poorly managed, and there is a long tradition of corruption in government and privilege for those of European descent. 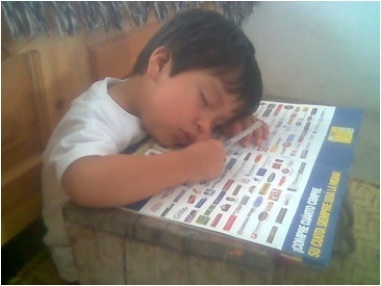 Above: Patty’s son Marlon, getting a little sleep after thinking too hard. On one of our visits to Otavalo in Ecuador, we were introduced to Elena Vinzuela, who was in high school at the time. She had promise and we helped her to get through college at the Universidad de San Francisco, earning her bachelors degree. Such an education is an acheivement for a woman of indigenous origin. Part of the problem is the grade school and high school educational system in Ecuador. Many families are living marginally, and the cost of bus transportation plus school uniforms and materials, in addition to lost income for not having the children work, makes it very expensive. Teachers are not well paid, and there is little status in the profession. Nevertheless, parents want their children to have better opportunities than they themselves had, and there is some progress. Gradually, the Otavalan indigenous people are becoming a major economic and political force. They value hard work, and are gifted business people. Their weaving is famous the world over. We met Galina Pevcheva where she was working as a waitress at the Chachama Grill. She was very personable and her natural kindness was apparent. We were going to be out of the country for some time, and we needed someone to stay in our house to take care of our cat Shuwa. We asked; she was happy to help -- and that was the start of a happy relationship that still connects us. Shuwa absolutely loved Galina, and when we would return from a trip and he knew she was going to leave, he was not pleased. 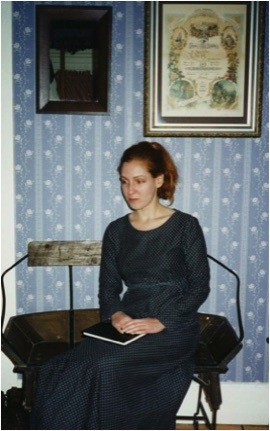 After her visits, Shuwa somehow got the idea that he deserved a place at the dining room table, and Alice and I got in the habit of placing a chair next to either of us, so he could sit next to us, keeping us company and providing commentary on the merits of the days meals. 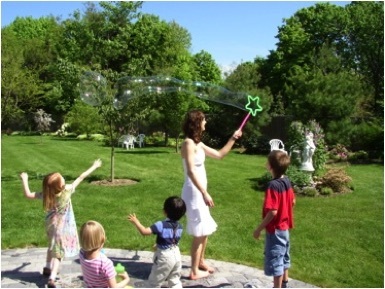 We would invite Galina to some of our gatherings for young people, as the photo of Galina blowing bubbles shows. Alice attended her graduation from Dowling College, and was the first person Galina told that she had fallen in love with Kos Mitev. We both think of Galina as a daughter. 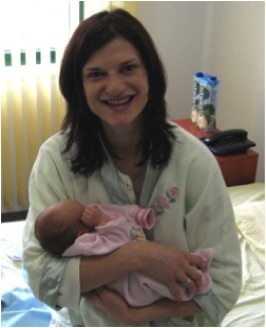 She recently married Kos, has returned to her home country of Bulgaria, and now has a baby boy, Mitko -- but she’s still part of our lives. 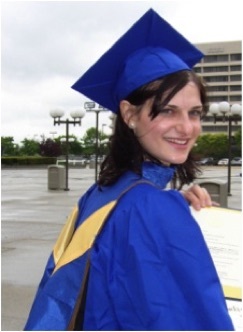 Top Left: Galina at her graduation from Dowling College. 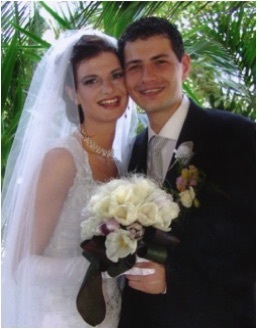 Top Middle: Galina and Kos at their wedding. 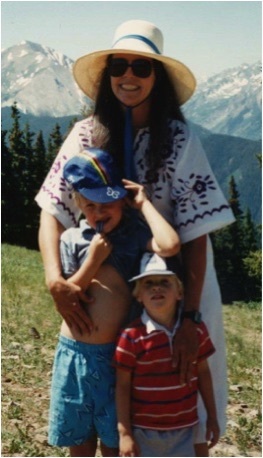 Top Right Galina as a young mother. 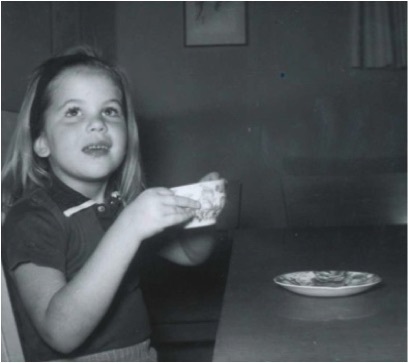 Bottom Left Galina blowing bubbles at a party at our home. Bottom Right Galina and baby Mitko. We have five grandchildren: Matt, Kenny, Ryan, Emily Rose and Noah. 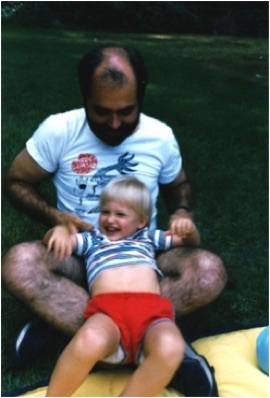 Matt graduated from Pomona College and is now at the University of Washington Law School. 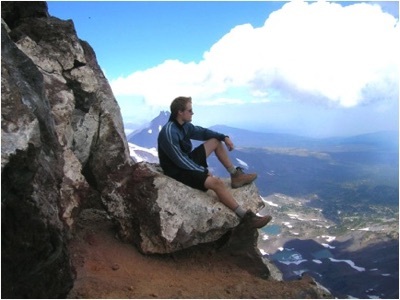 Kenny is finishing his undergraduate studies at Whitman College in Walla Walla Washington. 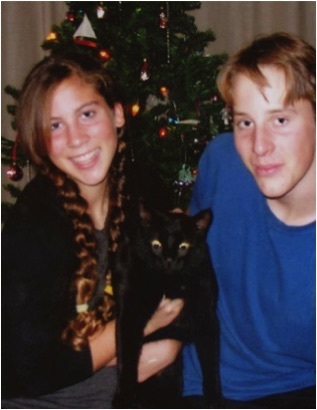 Ryan and Emily Rose live in the Bay Area with their parents and are in their teens. 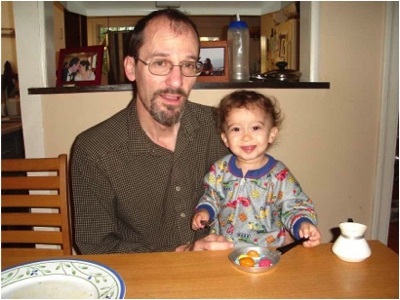 Noah is about two years old now, and a charmer The photo of the older grandchildren on the right is from 2003 in our home in Oregon. Above and Right: Matt and me goofing around in the Seattle area. The photos at right above are from about 1984 in Seattle. 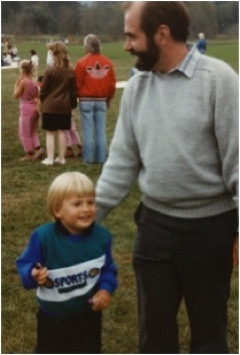 Matt has always been good natured and Kenny idealistic. It was easy while in Seattle to see Matt and Kenny, but when we moved to the midwest, we would only see them for short times during the summer. 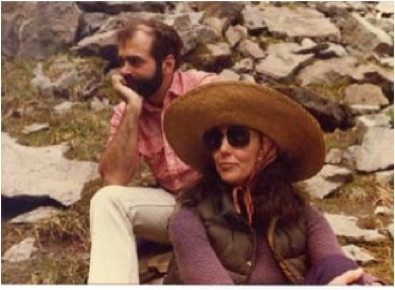 Alice and I were typically at the Aspen Center for Physics for about a month every summer. We invited the grandkids to come visit with us. These were very good times. I taught them about hiking, camping and fishing. I remember the first time I camped out with Matt. It was at Grizzly Lake. It was getting dark inside the tent, and I told Matt that about three in the morning if looked out at the sky, he would have a beautiful view of the Milky Way. Matt spent the whole night regularly poking his head through the tent flap to look at the stars. Two years later, I took Kenny to the same spot, and told Kenny the same thing. I remember asking Kenny if he wanted to be awakened at three in the morning in order to look at the stars, but he said he would rather sleep. The photo above of Matt and Kenny tells you a lot about their personalities. Matt is easy going and always sees the glass as half full. Kenny is also good natured, but more introspective, and has more of an artistic temperament. 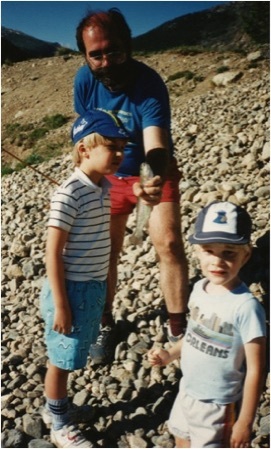 In the photo on the right, I had taken them for their first fishing expedition to the “Fish Market”, a little lake on Independence Pass near Aspen which is regularly stocked with fish. Matt was very curious about the trout, and Kenny less so. The next time we went to that lake, he and Alice spent the day constructing a stone castle above it. The irony is that now whenever we get together in the summer, it is Kenny who wants to go out and fish. They are both quite reasonable fly fisherman, and Kenny landed his first good-sized Atlantic Salmon two years ago from a kayak in Hosmer Lake, near our house in Oregon. Kenny has always been the more trusting of the two. Several years ago, we rode bikes up the trail to Paulina Lakes. This is about a 3000 foot elevation gain on backcountry trails. At one point, we passed some water falls and Kenny, who was looking very tired, desperately asked if we were close to the end. I answered back in a cheery voice that he shouldn’t worry, that we were half way there now. He looked as if he were going to die, but said little. In a quarter of a mile further, he broke out into a huge smile as we reached the lakes. Kenny always faces adversity with caution, but when the threat is passed is unreservedly joyful. He is also forgiving of mean people. Alice and I shared our love of mountains with Matt and Kenny, and we have been to many high places together. Of course as time goes by, Alice and I are no longer the ones who are leading and encouraging the young men to follow. Now they lead, and they pay me back for all the times I took them up exhausted to the top of some pass or volcano. 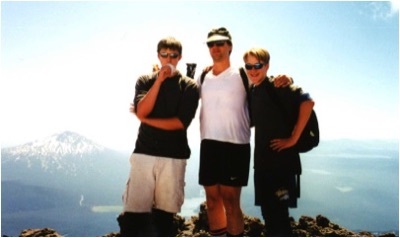 When they visit us in the summer, the boys and I try to go up to the top of the South Sister, a nearby volcano of a little over 10,000 feet. 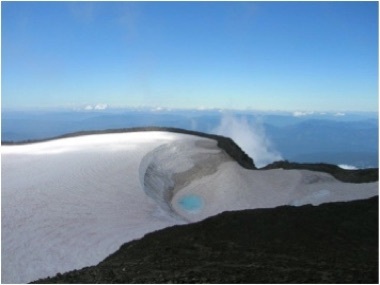 It is a long day’s hike, ascending about 5500 feet in about six miles, often over volcanic scree. The views are truly fantastic from the top. 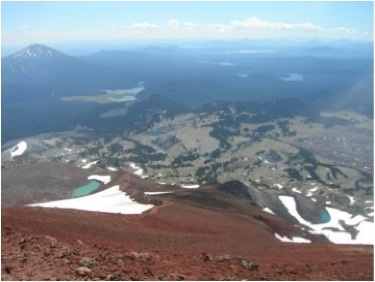 Upper left: The view descending from the summit of South Sister. Right: The family Anderson bags the top. the look of delight in Matt’s eyes, which then turned to apprehension as he looked at Alice and me: he expected us to take it away from him. He literally surrounded the glass with his arms and would not have given it up. But he was with family, and we were obeying the laws of France, so I figured why shouldn’t he be able to be treated as an adult, at least for one night. I think they enjoyed Europe very much. They took an active interest in European culture, from museums to the voluptuous models in advertisements for bath gels. In the airport in Copenhagen, where we said goodbye, there is a huge plastic statue of a bottle of beer. I remember Kenny staring at it in awe. To convince their parents that they had a wonderful and relaxed time and never had intergenerational conflict, Matt and Alice mugged for the photo above. Matt and Kenny have visited us many times in Sunriver. I taught them how to ski during visits there, and they have skied with some interesting people. One winter James Bjorken dropped by and all four of us went skiing. It was the first time that the grandkids went all the way down from the top. There is one place which is very steep, and if you stop, you have no choice but to go down from there. The first time I took them there I skied across to the drop-off, descended, and then waited for Matt and Kenny. They skied out and one after the other stopped. I knew exactly what they were feeling, but I knew they had no choice, so I waited. After a few minutes, there was a shaky descent by Matt followed by a similar one by Kenny, and of course, when Kenny got down, he was the happiest person on the planet. Sometimes they would be with us at the turn of the year. In the photos on the left and above, you see Kenny celebrating the New Year, and then later cleaning up the mess as Matt continues to celebrate. 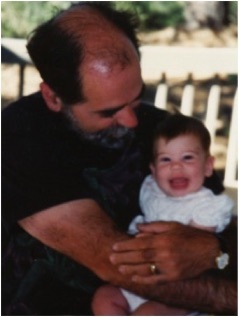 The principal reason we bought our second home in Oregon was so we could be closer to our families and grandchildren. We needed time now with Ryan and Emily Rose. When Ryan was born, we had stopped going to Aspen in the summer, and instead would drive out from Minnesota, where we then lived, to our place in Oregon for a few weeks vacation. 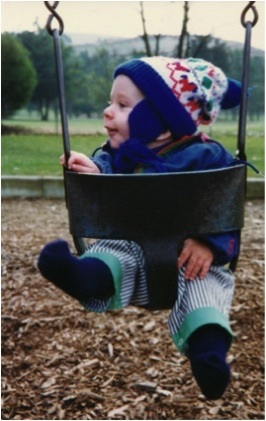 The first time Ryan visited there, he was just over one year old. Alice told Rachel she should take a break, and drive up with me to the mountains: she could take care of Ryan. As it turned out, Ryan knew that Alice was not Rachel, and Rachel was not there -- and he cried at the top of his lungs for the entire few hours we were gone. We then understood that Ryan was strong-willed. Of all the grandchildren, I identify with Ryan the most. He is the most inward thinking, and has the strongest drive. All of the grandchildren are very intelligent, but when combined with the willfulness, and that he is still exploring his abilities, Ryan’s intelligence is more obvious. Ryan began playing chess when he was very young, and by the age of 12, he could beat me. Several years ago, Ryan came out to visit us in New York. He decided he wanted to do this, and he would do it alone. 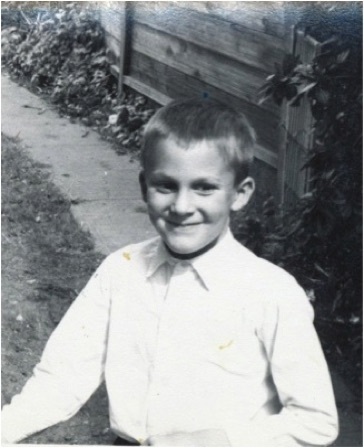 He was 11 or 12 at the time, and so had to be shepherded by the airlines to fly alone, but he did it. He accomplished a major task while there. 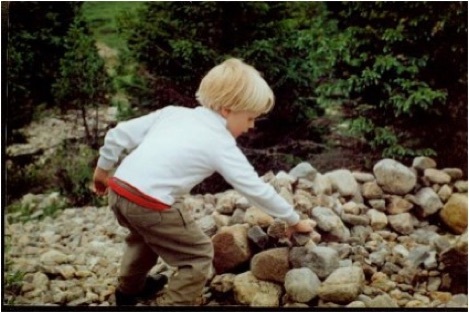 We had purchased about a ton of rocks with which Alice wanted to make a path, and she and Ryan built it, Ryan carrying huge slabs that would have challenged an adult. We also took Ryan down to Washington D. C, and rented a suite for a few days. Like his cousins, he had researched the things he wanted to see. Ryan developed a taste for Thai food, and he learned how to clean our clock playing hearts. Playing hearts is a family tradition, which centers around bugging Alice so that she cannot play well. Whenever we play, the grandchildren begin reciting ditties and stupid expressions which over the years I have taught them. It is irritating and childish -- but that is the purpose. Left: To become a Marxist, you first have to be a worker. 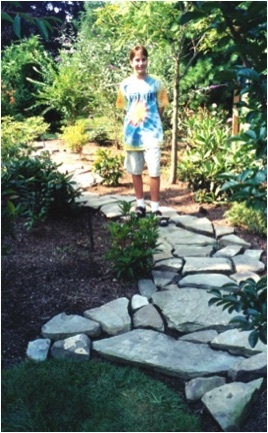 Ryan next to the path he built in our garden. As Ryan moves to the right, he moves to the right. Ryan in Washington D. C.
Our only granddaughter is Emily Rose. When she was tiny, she visited us in Oregon as you see in the photo to the right. I got to hold her and sing songs to her. 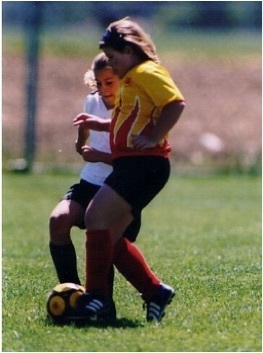 Like her brother, Emily is very intelligent and an excellent athlete as well. She is in general very easy- going although I expect she has a lot of her grandmother in her: One of the first things she ever said to me was when she was strapped in to her car seat, and I accelerated the car. She began yelling “Too fast! Too fast”. From the picture below, you see she also has a healthy love of money. Baby Rose came into the world today shortly before 11 A. M. Like many babies, she weighed approximately 7 pounds and was born healthy. 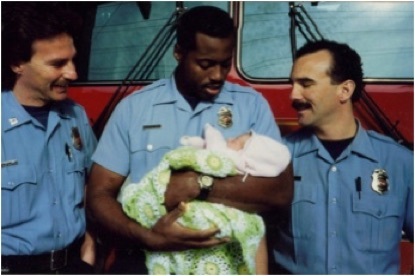 Unlike many babies, Rose wasn’t delivered by a doctor or a nurse, but by three firefighters. “This was a particularly exciting call, the kind you never forget. It leaves us with a really good feeling to be able to provide emergency care to someone in such a critical need and to leave the call with such positive results” said Senior Firefighter Lawrence Nunes. Firefighters were called at 10:42 A. M. to assist with a childbirth in progress. When crews arrived three and a half minutes later, the pregnant woman, who was delivering three days early, was lying on a bed. A friend was assisting her with her breathing because her husband had gone out on an errand. The baby’s head was showing in the birth canal, said firefighters. Quickly, Nunes, Firefighter Charles Thomas and Captain Ron Dalton prepared for emergency childbirth. Below: Emily Rose and the firefighters who delivered her. 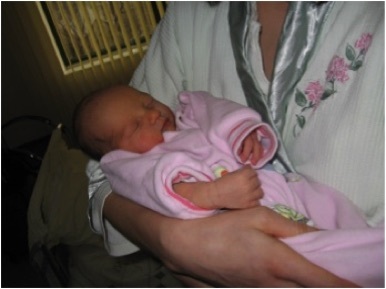 When the baby appeared, crews noticed the umbilical cord was wrapped around the baby’s neck. 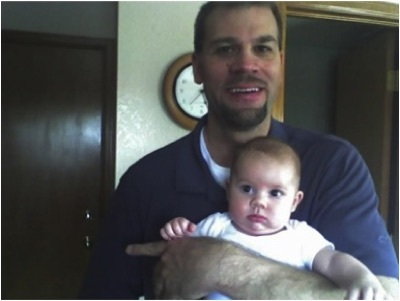 Thomas gently loosened the cord and slipped it over the baby’s neck. Crews suctioned the infant’s airway to clear any possible obstruction. 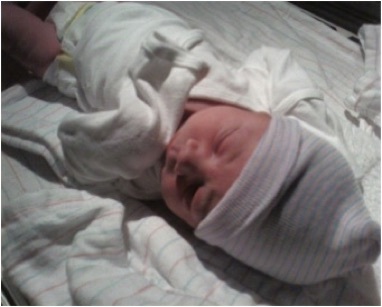 As a precaution, crews also gave the newborn oxygen. Paramedics arrived on the scene and released the fire crews. When the father arrived home from his trip to the gas station, he found more than just fire trucks and ambulances at his home--he found that his second child was a baby girl named Rose. When Emily Rose visits Sunriver in winter, she spends many hours on the sledding hill near our house. Often she is the only girl there, while there are a whole lot of boys her own age. She holds her own. I also have taught both her and Ryan to ski during visits to Oregon, but we have yet to do the whole mountain together. They both know how to fish, and they taught Alice and me how to catch crawdads. I have brought Ryan out to fly fish in a stream and he has done very well. When Emily was out with me and Ryan in a boat a couple of years ago, she caught the only fish. I was kind-hearted and wanted to throw it back. Emily Rose insisted we take it home and cook it. It was a very good fish. It is a great pleasure to watch her fish. She pays attention to every motion of the rod. She is a natural, and someday I hope to bring her out on some of the streams so she can learn how to fly cast. We hope that Emily Rose will sometime join us in Europe. Her interests are more for very exotic parts of the world like China or Russia, but Alice and I agree that the differences in food and culture might be a little overwhelming. Europe is a little easier to adjust to for a first trip. 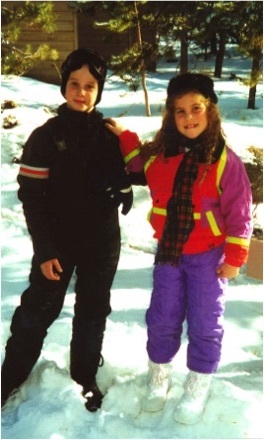 Above: Ryan and Emily Rose after sledding. Ryan has already been to Europe with us, and he is a real pleasure as a traveling companion. Sometimes Alice and I can get a little grouchy when we are tired, but Ryan understands this, lets it pass and works from there. He has grown into a remarkably diplomatic young man. When he was in Europe, he fell in love with creme brulee. His mom was having a birthday when he returned to the US, so he bought her a creme brulee blow torch. 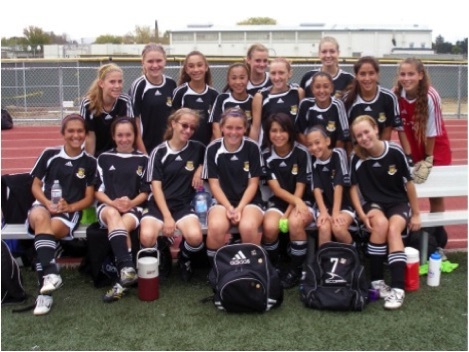 Above: Emily (in white) playing for another team a year ago, and the vicious team members of Emily’s soccer club. Grandchildren grow up. The photo on the right is Christmas 2007. Both Emily Rose and Ryan now look like young adults. The cat is real, and alive. It is not stuffed. Perhaps it got into the egg nog? No, Emily Rose was having fun with Photo Shop. 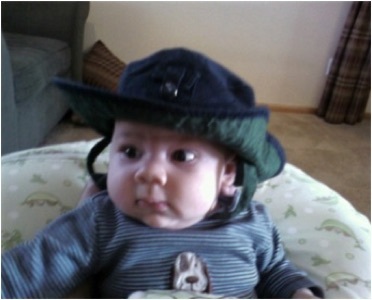 I have only been with my youngest grandson Noah for a few days last summer. He is barely two years old now. I expect we will get to know one another better soon. By personality, he seems to be very relaxed and adaptable. Given both of his parents, I expect he will be very smart and creative. 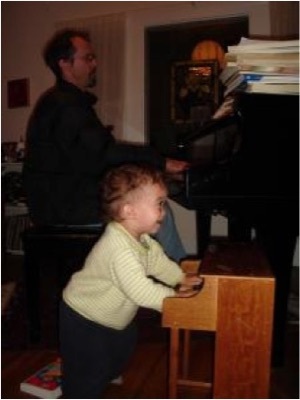 The photos below of David and Noah show that Noah has some interest in music. I think he has probably been taking lessons from Uncle Steve. He has this wonderful happy smile almost all of the time. Below left: David and Noah eating Below right: David and Noah playing their pianos. 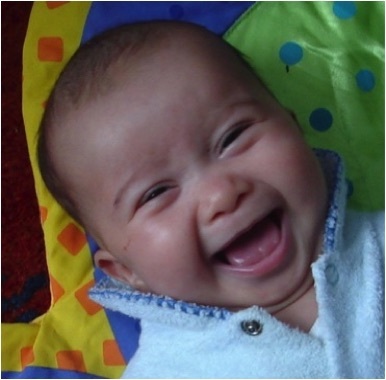 Alice is particularly fond of the two baby photos of Noah below. The hand on Noah’s head is David’s. 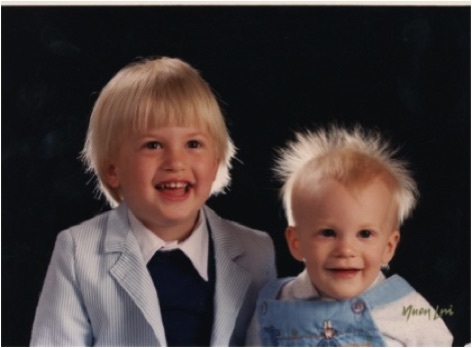 On the right, you see Noah’s “full body” smile. The newest addition to our family is Nicholas Ryan, the first great grandchild. of our extended family. The joyful parents are Janice and Sean, the daughter and son-in-law of Chris. 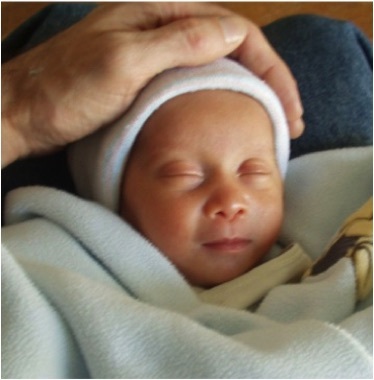 He is the first grandson in Steven and Chris’s family. Photos are below. 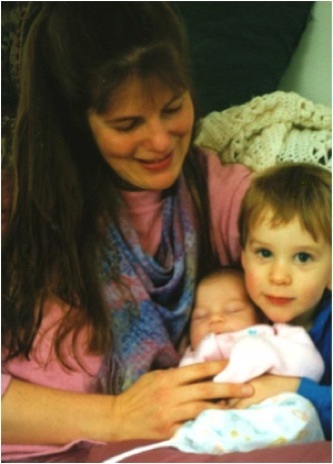 We hope to find an opportunity soon to meet Janice, Sean and Nicholas. We hope they will be able to find time to enjoy our “dacha” in Oregon, with its many recreational opportunities for young families. The closing photos are recent ones of family. The one on the left is from a recent hike to the seashore. Opportunities for all three of Alice’s children to have a chance for a day together are rare, and this hike was a very special one for them, allowing some important sharing and bonding. 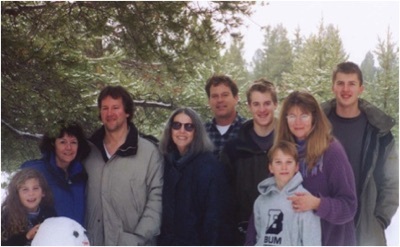 The shot below it shows Stephen’s and Rachel’s families on a visit to Sunriver about 5 years ago. Chris Medina, Stephen’s partner is on the left, and Ron, Rachel’s husband, is to the right of Alice. 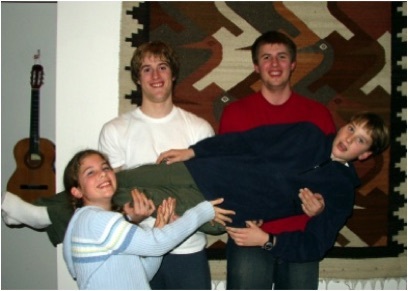 Of course as I write this, Ryan is as tall as his cousins, and Emily is getting tall too. The pose needs repeating; perhaps we shall all be together again next winter. I look forward to having a chance to take Ryan and Emily Rose to ski that dropoff where I have taken Kenny and Matt! The last photo is the most recent of the older grandchildren. 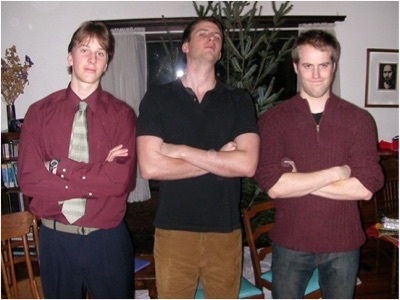 It was taken at a get together of the three children’s families in the Bay Area, in Christmas of 2007.